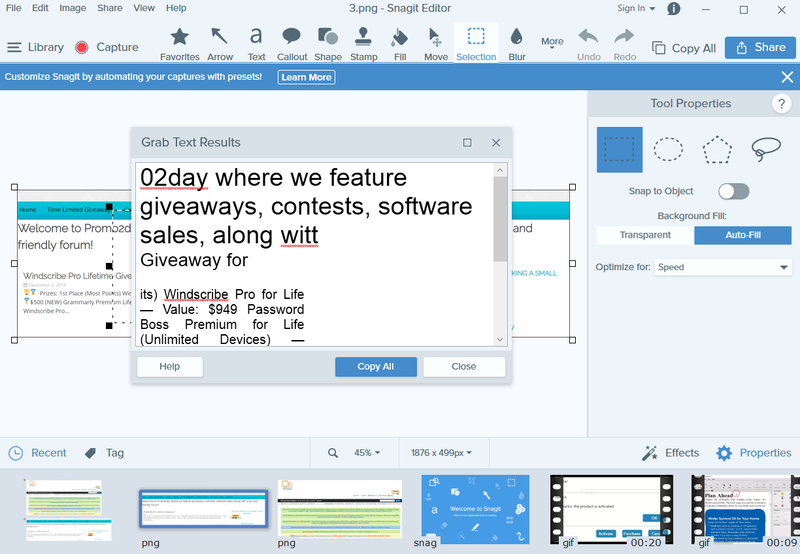 Snagit has long been the go-to screen capture and screen recording tool for millions of people worldwide, allowing anyone to quickly and easily capture and share information in easy-to-understand visual content. It is the Leader in Screen Capture Software. Take the hassle out of creating images and videos. Capture your screen, edit images, and deliver results. You will easily create images and videos to give feedback, create clear documentation, and show others exactly what you see. 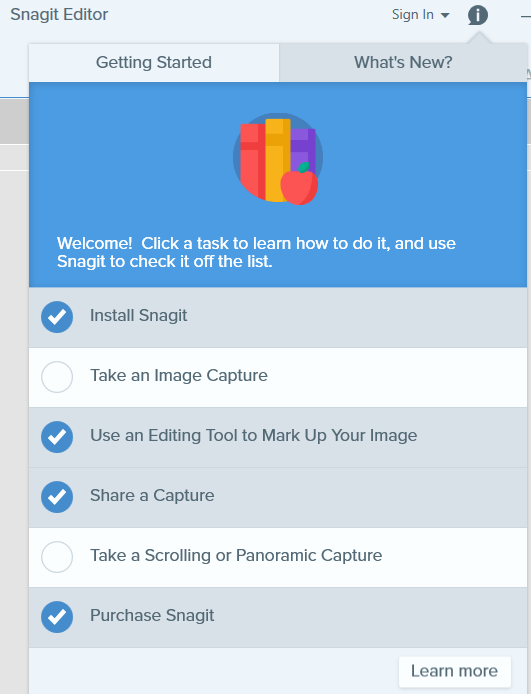 After you install Snagit, sign up for a TechSmith Account and start sharing to Screencast.com right away. 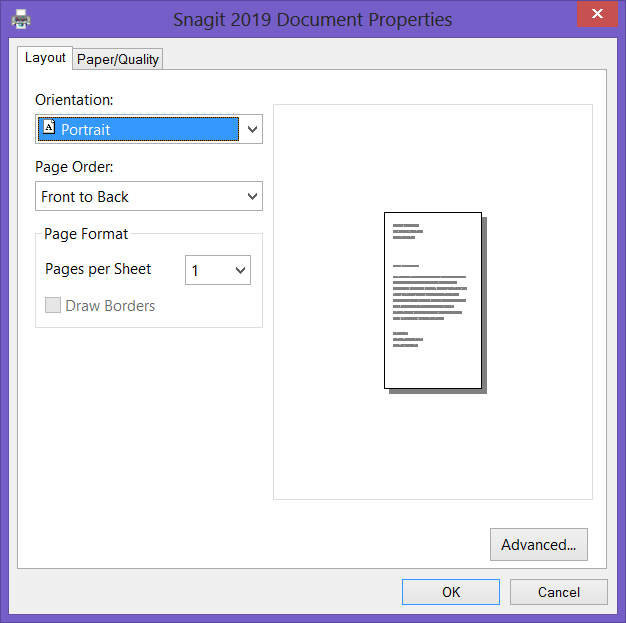 Snagit 2019 ups the ante by offering new features to help make it even easier to share visual content and help ensure that content has a longer shelf life. 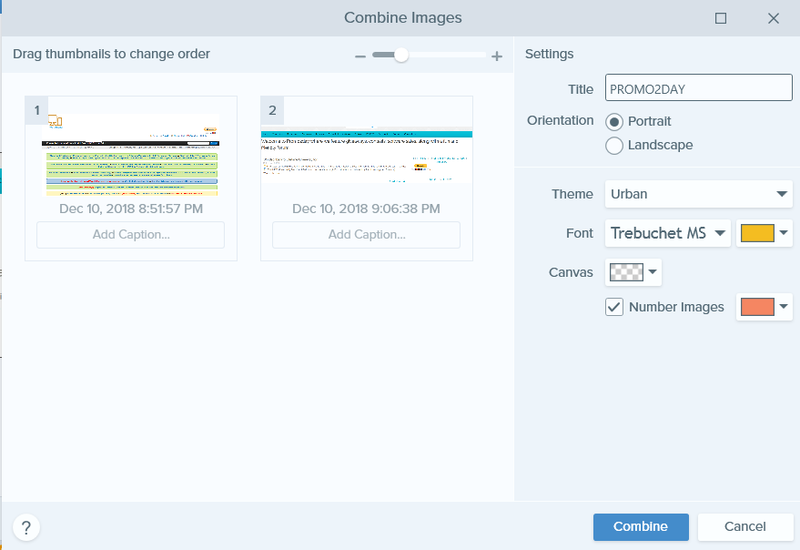 Whether you want to show a step-by-step process or simply have multiple screen captures in one image, Snagit 2019’s Combine Images Tool offers a fast and easy way to pull multiple images together. You will quickly combine images to create a set of instructions, a short how-to guide, or a side-by-side comparison. 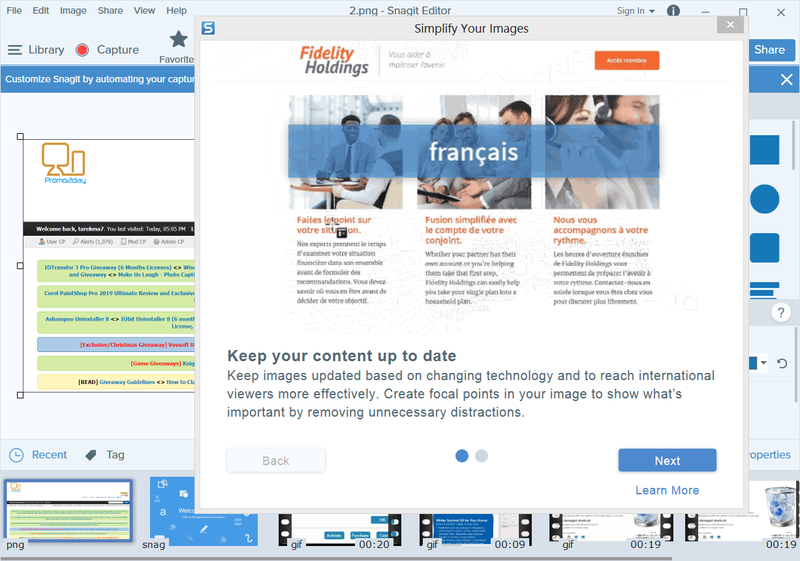 Snagit has grown substantially since its debut as a simple screenshot tool. But all these great features means it can be hard to find the tool you want. Here comes the Favorites Tool to the rescue! No more unnecessary tool switching or hunting down a specific style. 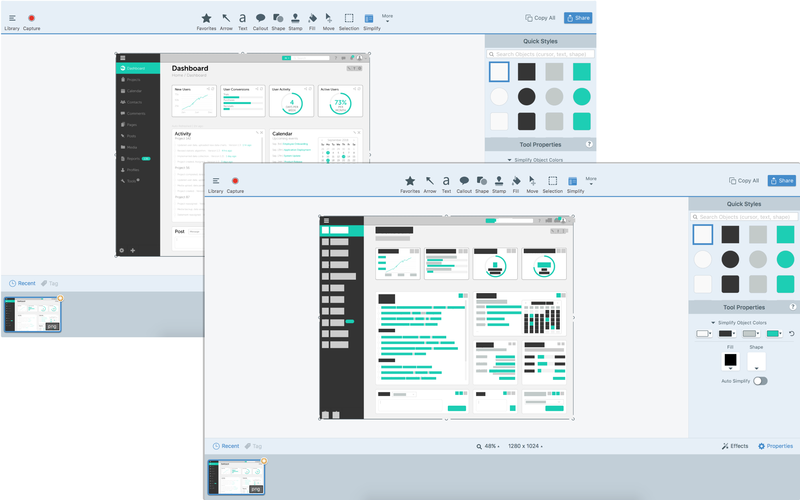 With the Favorites Tool, all your favorite tool styles are just a click away! 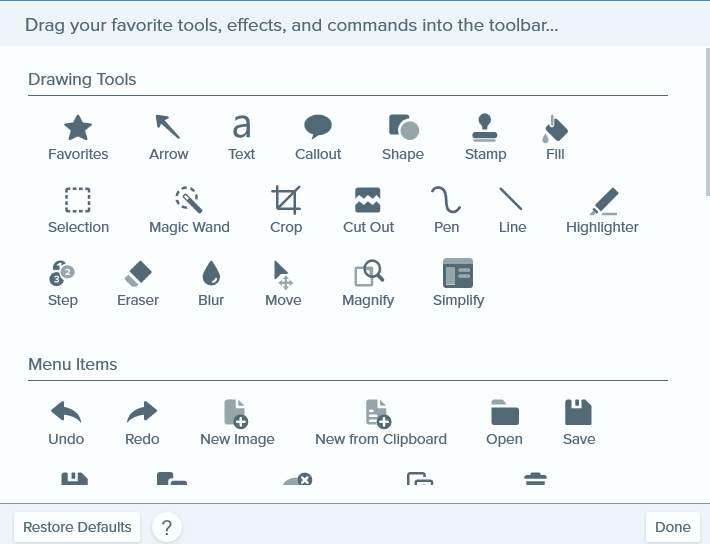 As a Snagit customer you already have access to nearly 2,000 pre-made stamps — including icons, symbols, cursors, and more that can be easily applied to your images. They’re great for marking up screenshots or even building simple infographics. 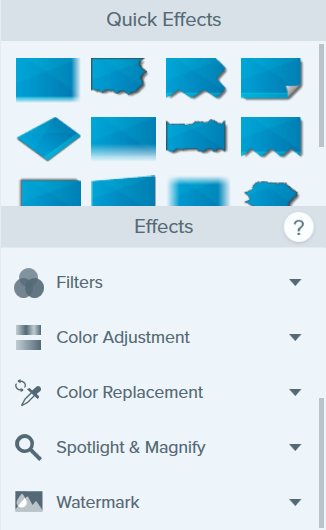 With Snagit 2019 you can easily search through the stamps library using keywords to find exactly what you’re looking for. 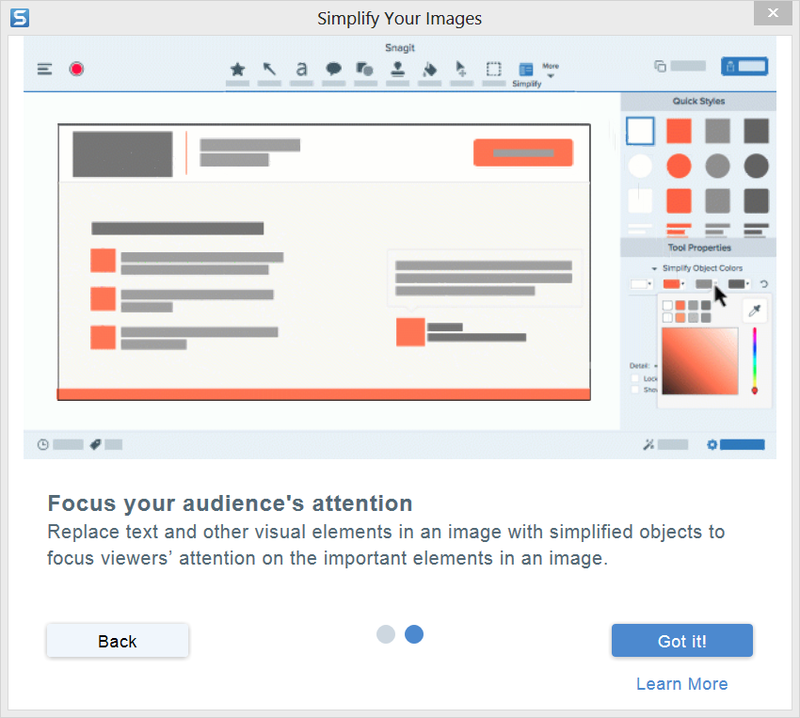 Using the principles of Simplified User Interface (SUI), the Simplify Tool removes distracting or unnecessary parts of an image (including unnecessary text) so that only the most relevant portions are visible — giving your content a longer shelf life and reducing the need for localization! 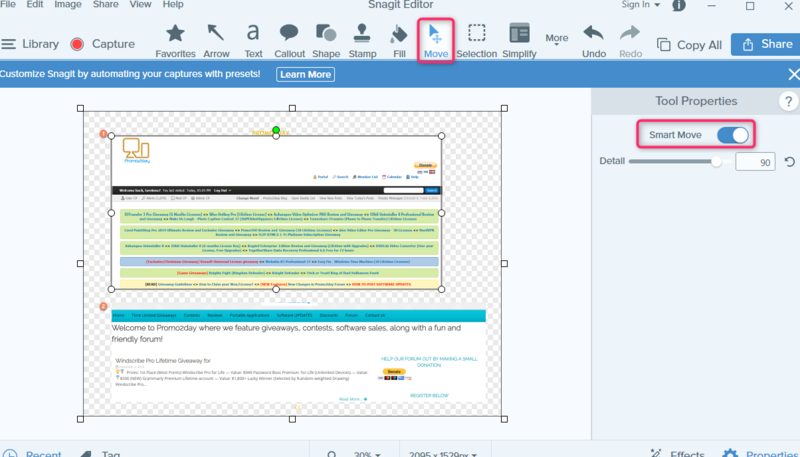 include high DPI support, which means the Snagit interface now looks even better on devices with higher-definition screens, such as Microsoft Surface and Macbook Pro. 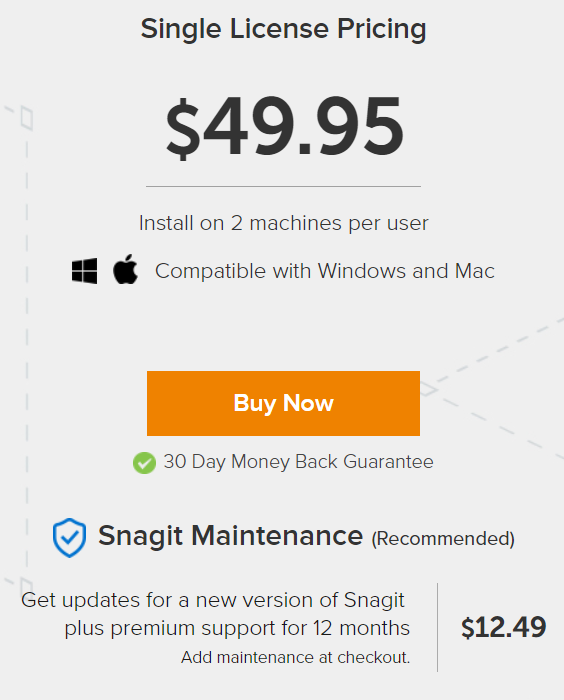 What are the benefits and features you get from Snagit? 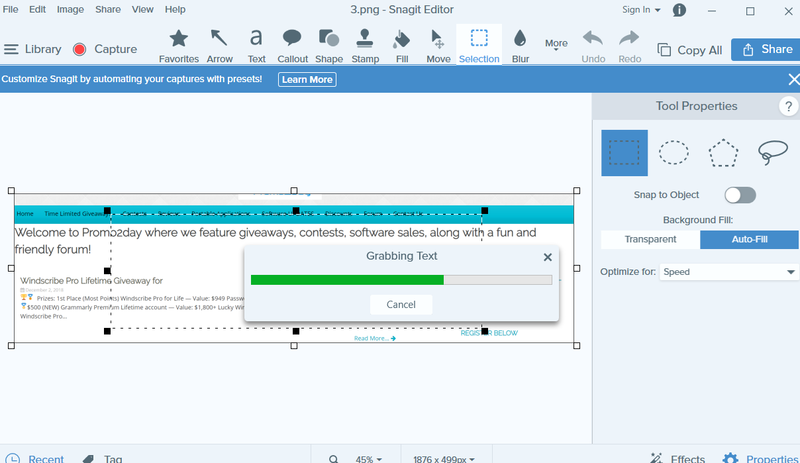 Snagit's award-winning screen capture software is the only program with built-in advanced image editing and screen recording. 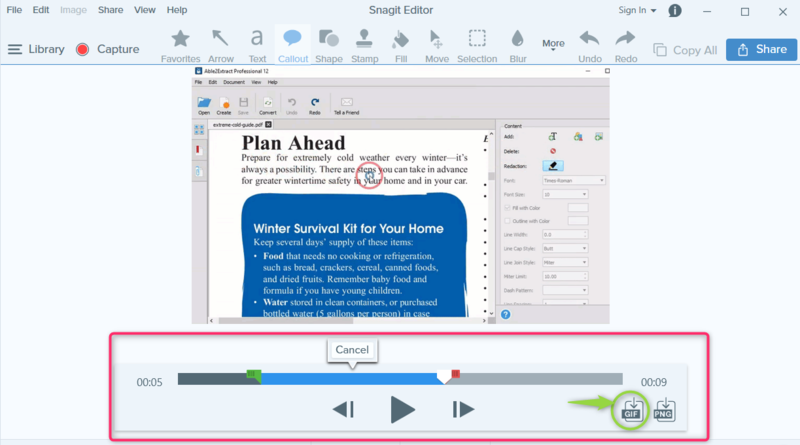 Snagit's screen recorder lets you quickly record yourself working through steps. Or grab individual frames out of the recorded video. Save your video file as an MPEG-4 or animated GIF. 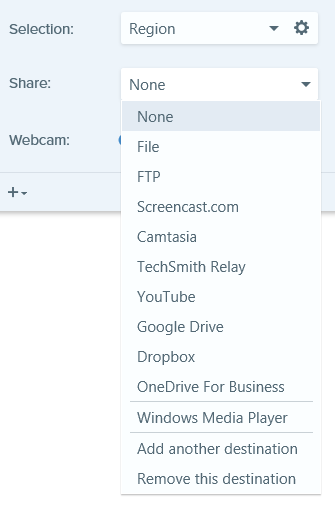 Toggle between webcam and screen recording during a video. Use the recorder to add a personal touch with teammates or clients, no matter where they are. Include audio in your videos from either a microphone or your computer’s system audio. Turn any short recording (.mp4) into an animated GIF, and quickly add it to a website, document, or chat. 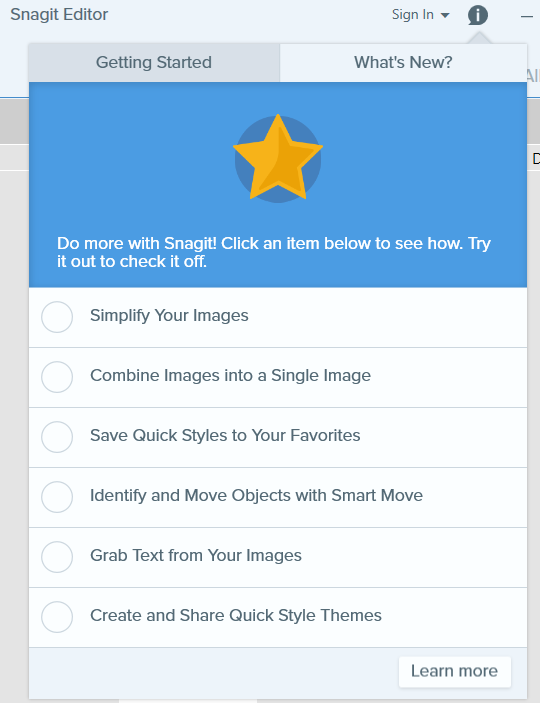 Snagit comes with default and custom options to create the perfect GIF, every time. Remove any unwanted sections from your screen recordings. Cut any section at the beginning, middle, or end of your video. The TechSmith Capture App lets you record your iOS screen with just a few taps and instantly share it back into Snagit for trimming. 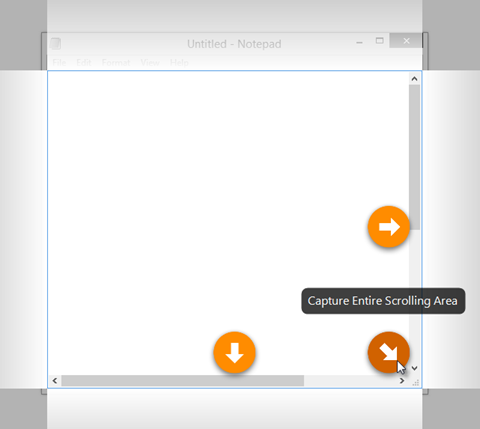 Capture your entire desktop, a region, a window, or a scrolling screen. Take a full-page, scrolling screenshot. 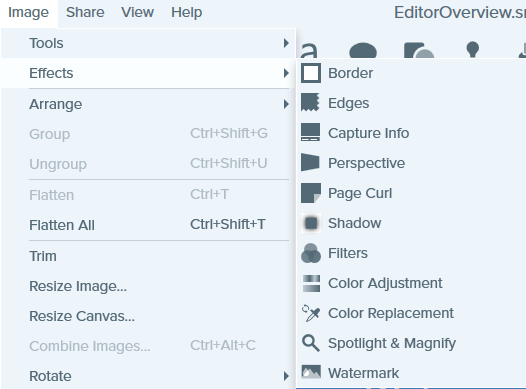 Snagit's screen capture tool makes it simple to grab vertical and horizontal scrolls, infinitely scrolling webpages, long chat messages, and everything in between. 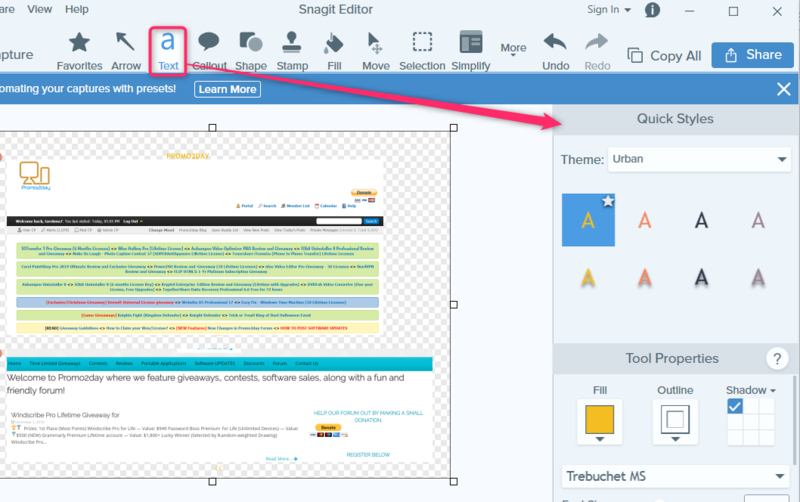 Snagit can capture the entire contents of a web browser or application window including the content that extends beyond the visible area in the window. 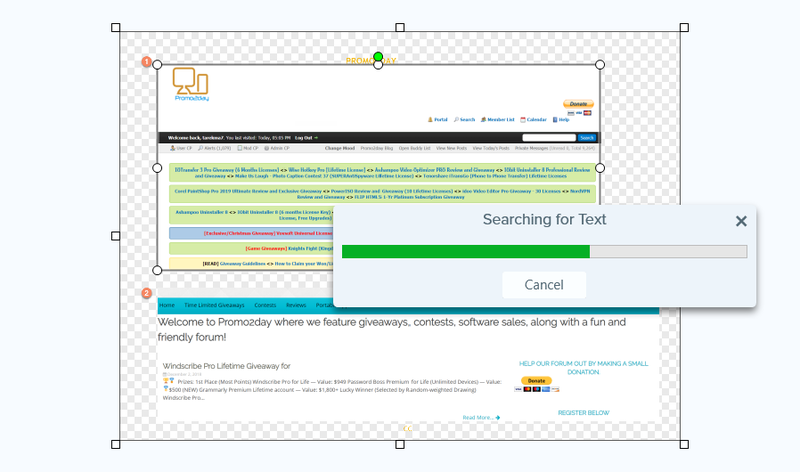 Annotate screen grabs with professional markup tools. Add personality and professionalism to your screenshots with a variety of pre-made styles. Or you can create your own. Quickly document steps and workflows with a series of numbers or letters that automatically increase. Automatically make objects in your screen captures movable. 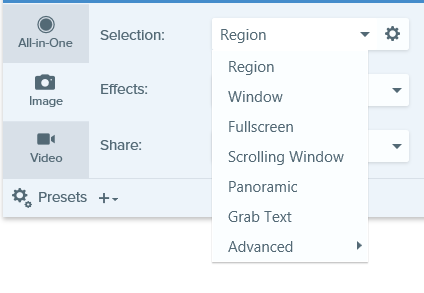 Rearrange buttons, delete text, or edit other elements in your screenshots. 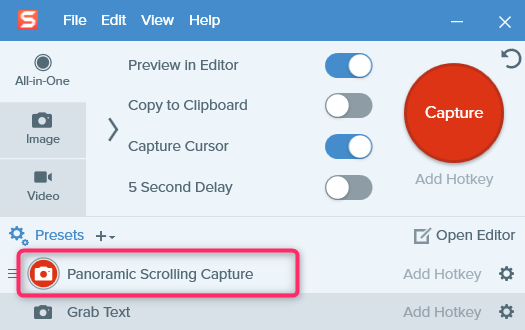 Snagit recognizes the text in your screenshots for quick editing. Change the words, font, colors, and size of the text in your screenshots without having to redesign the entire image. Use the Magic Wand tool to select an area on your image based on color. Quickly remove a background or replace the color in objects such as text or logos throughout a screenshot. Personalize your images with stickers specifically designed for screenshots. Get the latest stamps straight from Snagit, or download previous stamps here. Find all your past captures without wasting time digging for them. Your screen captures are automatically saved to your library. Tag captures to always keep your projects organized. 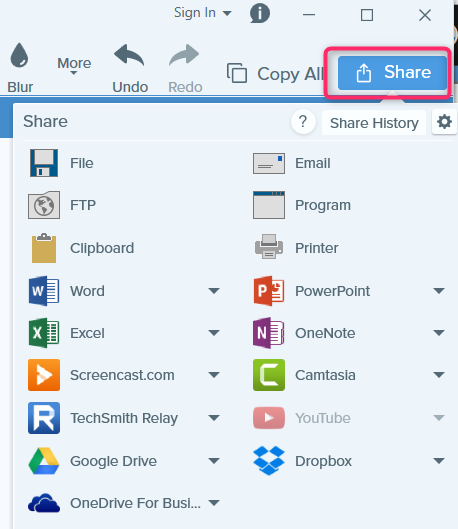 Quickly share your images or videos using the Snagit outputs. Add an effect to enhance an image. Effects can be applied to the entire image or a selection. 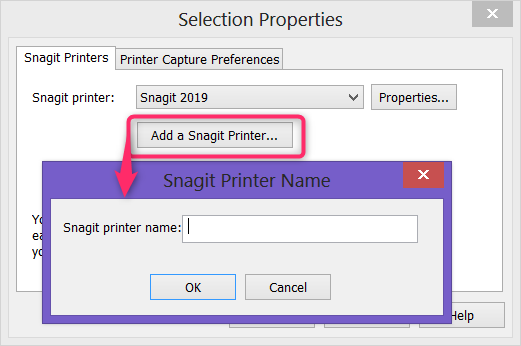 Send content from an application into Snagit Editor using the application's Print option. The process is very easy. 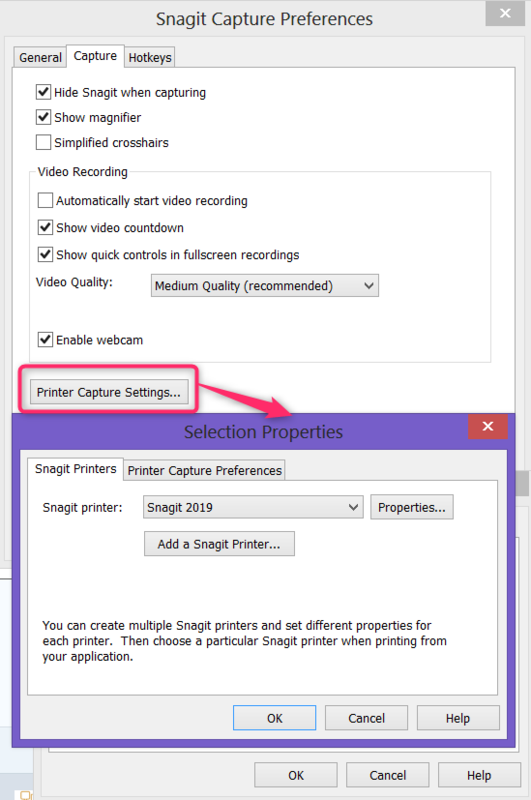 Simply, in the Capture window, select File, Capture Preferences, Capture tab, Printer Capture Settings. Walk someone through a process or issue, record a demonstration or a how-to video, record a presentation switching between the presentation slides and video of the speaker, send someone audio and visual feedback in a video, record a small portion of an online video or animation. 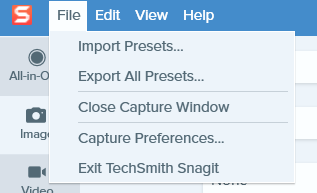 To open the Snagit Preferences, simply select Capture Window, File menu then Capture Preferences. 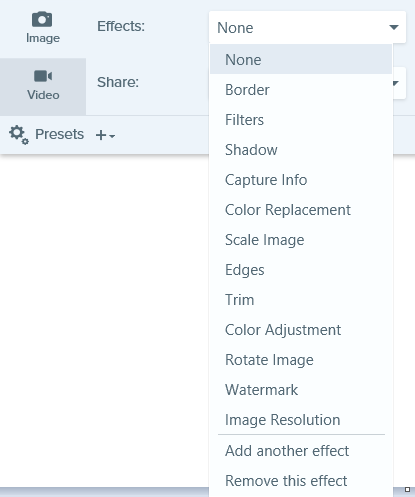 Alternatively you can select Snagit Editor, Edit, Editor Preferences. Is it better for you to Upgrade to the latest version? 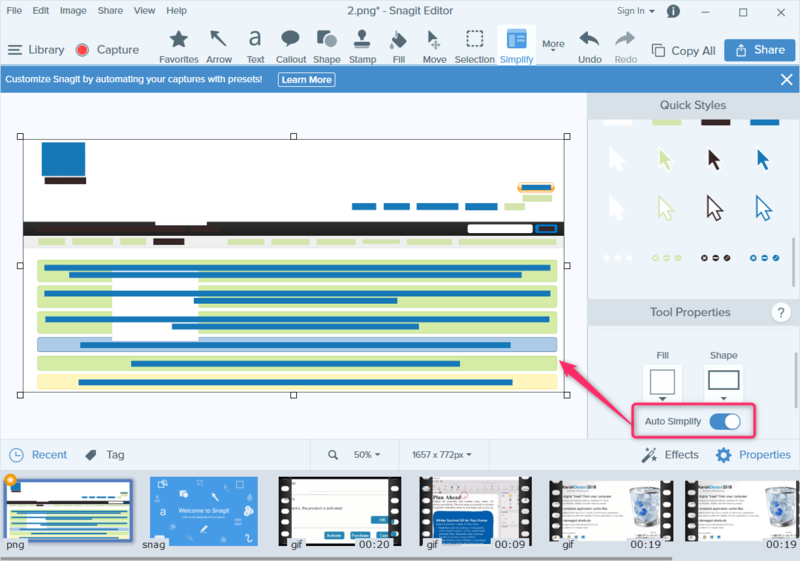 You can easily take separate Snagit images and combine them into one, organized piece of content. Perfect for step-by-step instructions, how-to guides, documentation, and more. 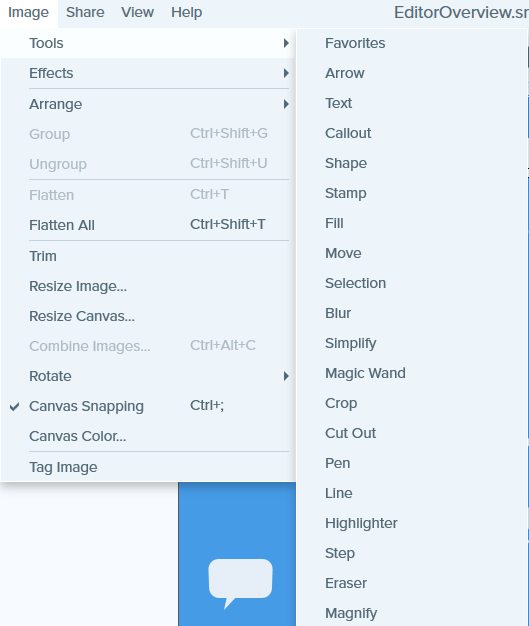 Quickly search through nearly 2,000 pre-made stamps in Snagit. These graphics include icons, symbols, cursors, and more that can be easily applied to your images. 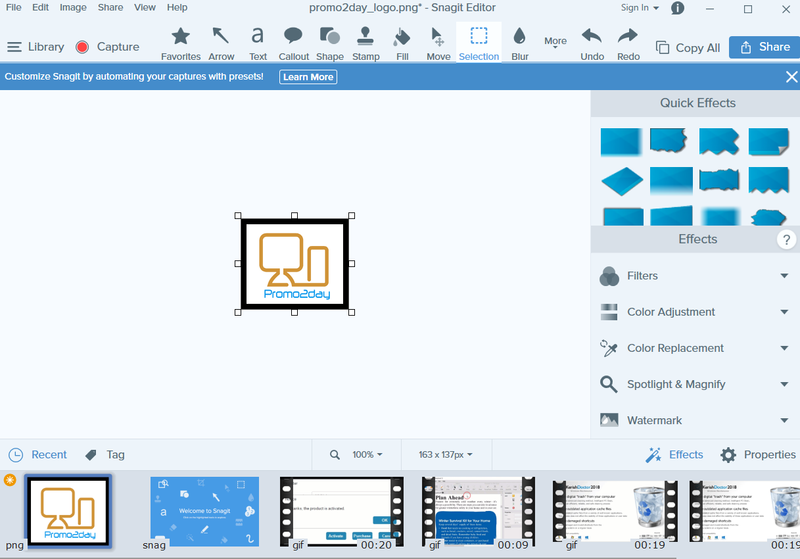 Snagit 2019 makes it easy to create powerful and practical images and video. It supports simplified user interface to extend the shelf life of your content and enables combining of multiple images to accelerate process documentation. 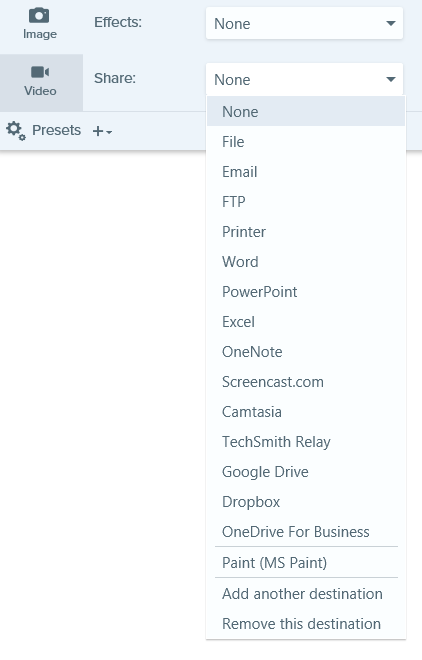 In addition, it helps to put most-used features right at your fingertips with the new Favorites tool. 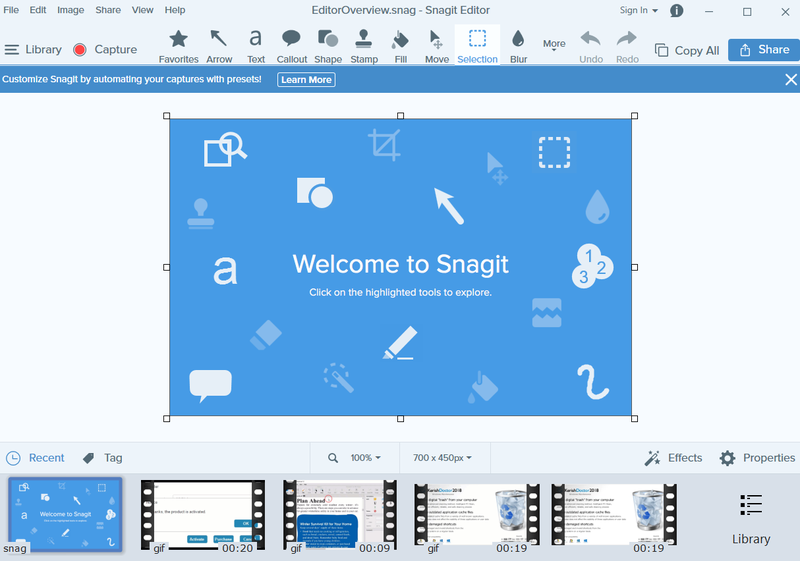 Snagit Tutorials: Free training videos, tutorials, and guides. Technical Support Articles: Browse our support articles for help with an issue or contact an expert. Community: Get help with the TechSmith user community. 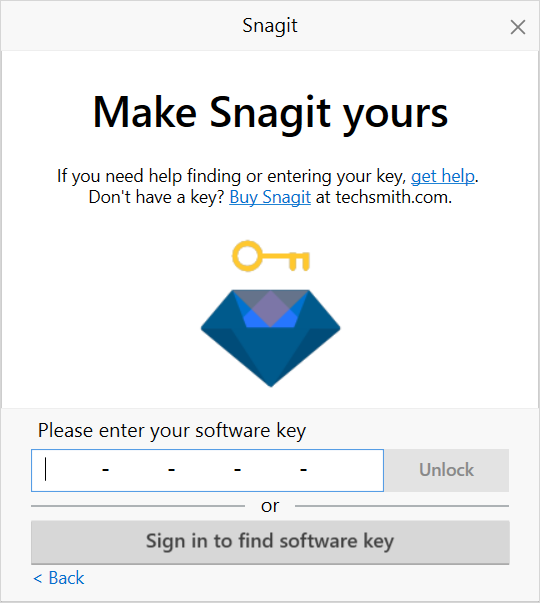 Enterprise Resources: Administrator resources and guides to help deploy and customize Snagit installations. Software Key Help: Learn how to unlock TechSmith products. Great review. Thank you tarek. Great review in detail with the new version & many improvements. Thanks for the very good work. Very good software. Top quality review for a professional soft. Thanks for the great review,Tarek.